"I have the honor of placing the first Renewal Scroll into the fire. As the scrolls burn, may our troubles turn to ashes with them. And now, for the next twenty-six hours, I expect you all to enjoy yourselves. I know I will. May the Prophets walk with us." 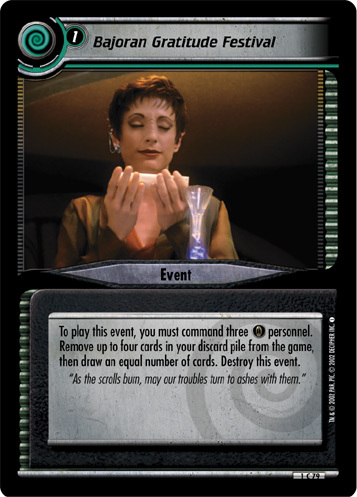 - Kira Nerys, "Fascination"
Many cultures, both here on Earth and in the galaxy at large, celebrate a holiday season. This year, The Continuing Committee is organizing a global celebration for the holidays; a time of giving, of kindness and compassion, and charity. Today, I have the honor and the privilege to announce the Peldor Gratitude Festival 2015. The Peldor Gratitude Festival officially begins on Tuesday, December 1st, and will run through Sunday, January 3rd, 2016. As part of this festival, we will be collecting donations across the globe for food banks and rewarding you, the community, for gathering together in the spirit of giving. As part of the Peldor Gratitude Festival, we are inviting each player group and community across the globe to host a special tournament series. In these special tournaments, players bring donation-eligible food items as an additional "fee," and those items are then collected and donated at the end of the event. These events are traditionally known as "Chase-the-Can" tournaments, and now they are officially part of the Peldor Gratitude Festival. In order to accommodate as many players as possible, we're offering two different versions of these tournaments! Win a game, win a can! The traditional Chase the Can version of these Peldor tournaments are normal, sanctioned tournaments. These can be any format, any card pool, for any of the three games. As an additional fee to participate, each player brings one non-perishable food item (for donation) for each round of the event. So for a three (3) round tournament, each player would bring three (3) items. After each game, the winner takes a "can" from his or her opponent and at the end of the tournament, each player that has the most cans claims a charitable victory! Make those cans work for you with special rules! In this variant, we're upping the ante! These tournaments can also be any game, any format, and any card pool, but they will be unsanctioned. Why unsanctioned? Because we're letting you bend the rules in a big way! Players can bring any number of food items with them, and "give" a can to charity to activate special abilities during their games! There's a different set of rules for each game. Check out the Bend the Rules instructions for First Edition, Second Edition, and Tribbles. Tournament directors, once you schedule your tournaments and get them in the system, please send a PM to Kamala and Worf Son of Mogh with the subject "PELDOR EVENT." Please include the Region of the event, the Format of the event, and the Date and Time. In addition, when setting up "Bend the Rules" tournaments, please make sure to select the "Bend the Rules" option from the Scenario dropdown. We'll publish an article on December 1st with all of the Peldor tournaments we know about to help people find your events! We wanted to make sure we rewarded everyone that comes out to participate in these tournaments. Of course, getting to play Trek with friends and donate to those in need are great rewards in and of themselves, but we wanted to offer something a little more! We're offering two (2) special achievement for participating in these Peldor tournaments, including one you can only get for playing in a Bend the Rules tournament! Play in any Peldor Gratitude Festival tournament during the 2015 Gratitude Festival. Play in an unsanctioned Bend the Rules tournament during the 2015 Gratitude Festival. The first, aptly titled Chase the Can, is a feat that is earned by anyone who plays in a Peldor tournament, no matter the game, format, or if it is sanctioned (Chase the Can) or unsanctioned (Bend the Rules). If you come out and participate in one of these tournaments between December 1st and December 29th, you'll earn the feat and our gratitude. The second achievement, titled Bend the Rules, can only be earned for participating in the unsanctioned Bend the Rules tournaments during the same time period. We hope that everyone will consider hosting at least one Bend the Rules tournament, if not more! In the spirit of giving, we wanted to reward our community members even more than exclusive achievements. We're giving everyone that plays in any Peldor tournament a chance to win a random prize drawing! And the more you play, the more chances you get! We'll be entering each winner and each participant into random drawings for foils, premium memberships, and more! Stay tuned for more details as the festival proceeds. We'll also be creating a limited number of collectible buttons/badges to celebrate the festival! Everyone that wins a Peldor tournament will get one of these badges for free, but we're also making them available for requisition via The Promenade. Each badge costs a total of $7, including shipping, but all of the proceeds from these buttons will be donated to charity. We'll be taking recommendations from you, the community, about which charity to donate to, so start posting suggestions! We'll hold a final vote with the top candidates and donate all of the proceeds to the winning charity. 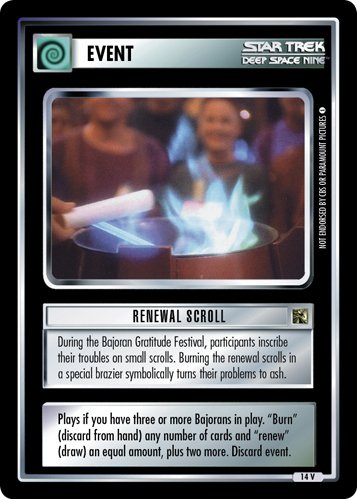 So if you didn't manage to win a Peldor tournament, or if you want to celebrate the festival but can't make it out to a tournament, you can requisition a 2015 Peldor Gratitude Festival badge and make a difference that way! If you're having trouble finding a local food bank to accept your donations, don't worry, we're here to help. This website can help you find food banks or charities all around the world. In addition, we'll be posting suggestions in the comment thread for this article, and we want even more suggestions from you! We hope you are excited about the Peldor tournaments, achievements, badges and opportunities to earn some prizes while you celebrate the holidays and give to those in need. But we want you to share the joy! We're asking all players, tournament directors, and members of the community to spread the word and share their photos, videos, and holiday greetings with the hashtag #peldorjoi. We'll be highlighting some of the best #peldorjoi content on our Twitter and Facebook pages. In addition, there will be a weekly article from our own Andrea Heywood-Lobban (Kamala) highlighting the best #peldorjoi content of the previous week. Andrea will also be reviewing the results of the previous week's Peldor tournaments, and previewing those that are coming up. We hope you'll join us every Sunday, starting December 6th for the Peldor Gratitude Festival Round-up! We're thankful for all of you in the community, and grateful for the opportunity to host the Peldor Gratitude Festival. The spirit of kindness, giving, and generosity has always been ingrained in the future of Star Trek, and we're proud to represent that spirit as part of this year's holiday. We hope that you all have a wonderful holiday season filled with joy, laughter, and lots and lots of Trek. Live long and prosper, and #peldorjoi!